The answer to all of your play date stuff problems! This bag turns into a blanket and back into a bag. Carry all of your children's toys and lunch bag in the blag to the park, unhook the handle from the blanket and spread it out. The toys are already to be played with, just sit the child down and the fun starts! Need to leave in a hurry? Leave the child in the center of the blanket, hook the handle through the rings until the bag is ready; pick up the baby then bag and you are ready to go! 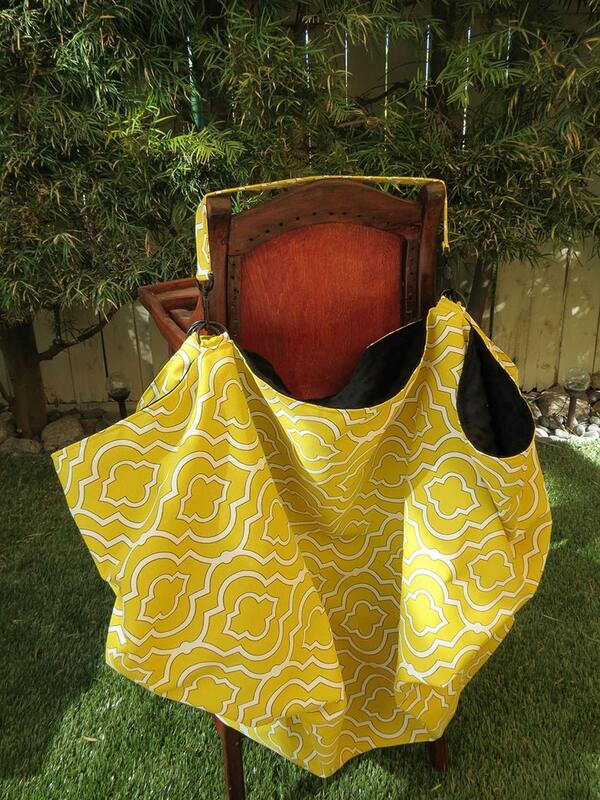 This Deluxe Blag is made of water resistant outer fabric featuring a yellow and white marrakesh design. The inside is make of black ultra cuddly soft fabric. As a blanket, measures about 53" x 60". As a bag, measures about 25" tall x 35" wide. Handle is 1" wide x 21" long.